There have been few startups that have gotten as hot as quickly as Instagram. The photo-sharing application for the iPhone surged past 100,000 users less than a week after they first launched. In less than three months, they hit a million users. Now they’re well north of 1.5 million users. Not surprisingly, that kind of growth has attracted a lot of interest from investors. In fact, many of the big players were fighting for a chance to get in on the startup’s Series A, we’ve heard. And now, we have a winner. Benchmark Capital is leading Instagram’s $7 million Series A round. Also participating is initial investor Baseline Ventures and angels: Square’s Jack Dorsey, Chris Sacca (through his Lowercase Capital fund), and Quora’s Adam D’Angelo. Benchmark’s Matt Cohler, who spearheaded the deal alongside Peter Fenton, will join Instagram’s Board. He joins Instagram co-founder Kevin Systrom and Baseline’s Steve Anderson there. Systrom declined to give Instagram’s valuation based on the funding, though it’s probably safe to assume that it’s well north of $20 million. 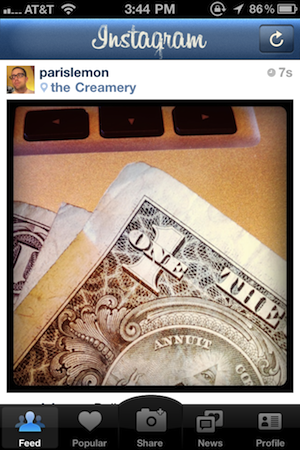 Thus ends months of speculation about the Instagram funding. Rumors started flowing back in November after it was revealed that original Instagram-backer, Andreessen Horowitz, would be backing Instagram rival PicPlz for their Series A. Initial reports had Sequoia leading the way, though we debunked those. Then back in December, VentureBeat reported that Benchmark was likely the winning suitor. We had heard that was likely the case, though the deal was far from done at that point. Now it is. So, they have the money. Now what are they doing to do with it? “We’re going to grow the team to support the scale and massive growth we’re seeing,” Systrom tells us. “We want to build a world-class engineering team,” he continues. I can already see the comments: why does a photo-sharing app for the iPhone need a world-class engineering team? Because they have much grander goals. “Instagram has an underlying ambition to change the way we see the world – to connect people from all over the world, and enable people to tell their story through a rich visual dialogue. Our new capital will allow us to scale to the opportunity at hand across platforms both on mobile and the web,” Systrom says. Instagram addicts will read that last bit and wonder if that means a richer web presence is coming soon? Yes, though Systrom won’t pin down a specific date. “We’ve got some special stuff up our sleeve,” is what he will say. What about the API? “The API is coming along really strong and should be out soon. We already have select partners playing with it,” he says. And yes, Android is coming soon too — though again, no firm date. More firm is “some special stuff in store” for the upcoming SXSW festival in Austin, Texas in early March. The team will be there hoping to capture the fire that first Twitter and then Foursquare were able to capture before them during the event. Of course, they don’t really need to catch anymore on fire. The service currently has 1.75 million users. They’ve already seen some 78 million “likes” on pictures by users. And there are currently some 290,000 photos posted per day. Also interesting, roughly half of Instagram’s users are not just outside of the Silicon Valley bubble, but outside of the entire United States. Japan is an especially large region of activity. And with their recent launch of a new hashtag feature, they’ve already seen some 500,000 pictures upload to take advantage of it, he says. Instagram’s funding follows rival Path’s new round yesterday. Expect this space to continue to get hotter.